“I’m Sorry”–Is Someone Longing to Hear These Words From You? Lay your pride aside–say I’m sorry! Then it hit me, WHY my heart was so heavy, and I was reminded again how God is always right on time with His words to me. I was looking and longing for reconciliation–STILL! I wasn’t exactly sure until I looked it up on my timeline on Facebook, but it was 3 years ago the 25th that I confronted and exposed my childhood publicly–something I’d attempted to do privately a few times via ignored letters, but never publicly. (There were compelling circumstances which led me to that posting) Interestingly, that process freed me from the burden I’d carried my entire life, that of feeling somehow responsible for the years of abuse, but it did not give me the desired outcome–an “I’m so sorry I/we hurt you!”–reconciliation! Bottom line, an “I’m sorry” years ago would have saved our family from the continued pain and strained or non-existent relationships. An “I’m sorry” would have saved me from a life-time of questioning myself, my motives, God’s “design” of me, my worthiness of being treated properly . . . (I won’t bore you with this list any further, it is not the point of this blog post). 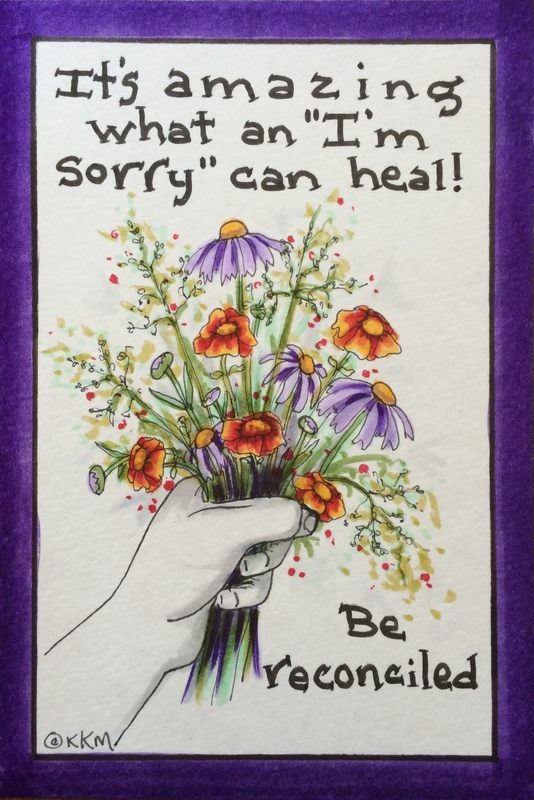 An “I’m sorry” would have begun the healing in their hearts and kept them from going down the insecure at best, path of self-righteousness (doing things to “please” God). If you will, offering unacceptable gifts to God because they had not yet been reconciled to the one they had hurt. In a nutshell–NOT saying “I’m sorry” (being reconciled) robs everyone involved of relationship–with each other, with others and most importantly, with God. Now for the point of this post–If you’ve read this and feel a conviction–for Pete’s sake, stop where you are, drop your hypocritical gift to God, turn around and run to that person and say “I’m sorry!” Be reconciled, no matter how much crow you have to eat or what the consequences on this earth may be. It could open a floodgate of healing and possibly save a soul for eternity–it may be yours you are saving. As for me–I’m still waiting . . . but God is working. 😉 Where there is life there is hope.